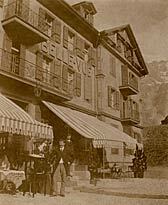 The Hotel Bellevue des Alpes ranks among the few remaining grand hotels of the nineteenth century. 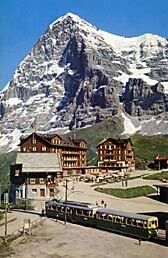 The Kleine Scheidegg lies amid alpine splendour at the foot of the Eiger, Mönch and Jungfrau at 2070m above Grindelwald and Wengen. As the centre of the ski and hiking region, it is also the direct starting point for the Jungfraujoch. 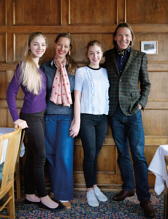 The historically important hotel is still run as a family business with tradition in mind. Attached to the hotel is a day restaurant with seating for 120 on the panoramic terrace. The hotel is open from 21st December 2018 until 7th April 2019 and from 20th June until 15th September 2019. As we choose not to use any kind of third-party reservation or booking platforms, we are therefore able to ensure that you receive the best possible offer when booking through our reception desk. The Hotel Bellevue des Alpes offers 100 guest beds. Room prices are calculated per night and include a 4-course evening dinner, breakfast buffet, service charge and VAT. For bookings and enquiries please contact us by phone or by e-mail. Kleine Scheidegg is a car-free region. The only way to reach the Hotel Bellevue des Alpes, both in summer and winter, is with the Wengernalp Railway. 1. From Lauterbrunnen via Wengen and on to the "Kleine Scheidegg" station. 2. From Grindelwald-Grund to the "Kleine Scheidegg" station. Both Lauterbrunnen and Grindelwald are easily reached thanks to excellent rail connections via Bern-Spiez-Interlaken, Brig-Spiez-Interlaken or Lucerne-Interlaken. By car you travel via Interlaken to Lauterbrunnen or Grindelwald Grund. On arriving you find available parking in the multi-storey car park, as well as public parking places in Lauterbrunnen. Grindelwald Grund has outdoor parking and in Grindelwald Dorf you additionally find a multi-storey car park by the railway station. Please take note of the Wengernalp Railway timetable when planning your journey. Trains run on a half-hourly schedule with the final departures leaving early in the evening: from Lauterbrunnen 17.37h in winter, 18.37h in summer, from Grindelwald Grund 17.55h in winter, 18.55h in summer. “Adolf Seiler here, who's that? Make it short.” That's what you would have heard on the telephone if you dialled No.1 Grindelwald at the beginning of the 20th century. Adolf Seiler was an authority, a charismatic personality who held sway over the Scheidegg pass for some 50 years. He was the heir to the wrestling king Christian Seiler, who in 1840 built the inn “Zur Gemse” on the saddle between Lauberhorn and Dreigestirn. Christian was the founder, Adolf brought Victorian drive and energy to the enterprise; he looked for and found spring water, conducted sewage to Grindelwald and, being an good artillery man, set up a cannon in front of the inn. It thundered out each time a guest, such as Alphonse Daudet - of Tartarin fame - reached the summit of the Eiger, Mönch or Jungfrau. The mule train which carried goods and guests up from the two valleys either side of the Scheidegg, a climb of some 1000 metres, were also part of the successful solution to the logistics problem. The inn “Zur Gemse” became known as the “Bellevue Hotel” and - long before the railway was built in 1893 - business boomed, gladdening both heart and pocket. In 1892 Adolf became a father. Emma, the only child and future sole heir, was born and there was widespread delight not only in the family place of origin, Bönigen on the lake of Brienz but also in Grindelwald and right up to the Wärgistal and Wengernalp, the Scheidegg's neighbouring alp co-operatives. What pleased Adolf, pleased everyone. The Wengernalp co-operative decided to celebrate the event by creating a piece of real estate which would provide a little extra something year after year. Alongside the Hotel Bellevue they built the Hotel des Alpes. In 1893 Zürich tycoons built the Wengernalp Railway from Lauterbrunnen over the Scheidegg to Grindelwald. And in 1912 the Zürich banker-engineer and multitalent Guyer-Zeller constructed the highest railway line in the Alps, through the Eiger mountain up to the Jungfraujoch. So it was goodbye to the mules, and partly also to the Wengernalp co-operative but not to the Seiler family. The Alp Einig, the annual assembly of the alp co-operative decided that they were better at making cheese than running the Hotel Des Alpes. So this was sold to Adolf for about 100,000 gold francs. The Seilers' success story, like so many others, came to an end in 1914. However, they survived the crisis of the First World War. The hotels were closed but they had reserves to fall back on, so for four years they hibernated like marmots. Meanwhile, Emma had grown into a pretty young girl and had acquired social polish in London and Paris. And she was receiving ever more frequent visits from the cavalry officer Lieutenant Fritz von Almen of Trümmelbach which were to culminate in marriage. Over the winter they worked together in hotels, finally with Count Renesse in the legendary Palace Hotel in Maloja as managers. 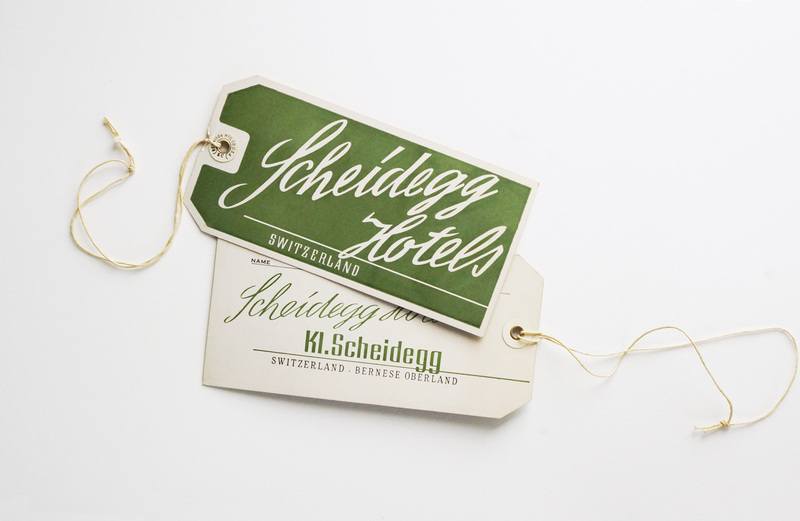 But in 1925 they decided the Upper Engadine was too remote und asked father and father-in-law Adolf whether just possibly, under certain conditions, the two hotels on the Scheidegg might be for sale. They were. The entire Trümmelbach enterprise were brought in and everyone knuckled down. Fritz's mother, Margrith von Almen Hirni, a widow and the first female secondary school teacher in the Bernese Oberland, saw clouds on the horizon but succumbed to the charm of her only son and his wife Emma. Then came the Roaring, Charleston-mad Twenties and Thirties. The Bellevue and Des Alpes had been summer season only hotels. Now central heating was installed and a log fire in the improvised bar. But it was really only warm in bed or in the bar. The English - initiators of modern alpine skiing - showed great enthusiasm and climbed the Lauberhorn on skis every day, skiing down once a day to Wengen or Grindelwald, from where the Wengernalp rack railway, which with great reluctance had also switched over to winter operation, took them back up to the 2064 m Scheidegg. Ticket collectors and engine drivers were regularly invited to a small party in the buffet to thank them for “such an excellent journey”. Fritz and Emma von Almen-Seiler's winter season adventure was a success from its first season in 1925/26. Between 1929 and 1930 the hotels were fitted out to withstand the rigours of winter and already then equipped with many bathrooms. The English-style foyer, the lounge, was built and the bar was decorated with watercolours by Walter Trier, the illustrator of Erich Kästner's books. The small banqueting room in French style, with a view of the north face of the Eiger, took shape and was provided with a grand piano. The restaurant, with a view stretching from the Blümlisalp to the Mönch was built, and the tea terrace - to be used wearing a fur coat when the föhn was blowing hard! The “Gaststube” was not rustic in style but still looked genuine and a four-piece orchestra played there nightly. Every winter a correspondent of the London “Tatler” - Great Britain's number one society magazine, founded in 1901 and still published today - spent three weeks in the Hotel Bellevue. The English in those days were skiing fanatics. When the sun shone too strongly and the snow on the Lauberhorn slopes became wet, a notice was placed in front of the hotel which read “Don't touch the Lauberhorn after eleven”. And this exhortation was heeded by one and all, as no one wanted to be skiing in half-frozen ruts the next day. In those days the season opened in late November or early December and ended as late as May. Those pre global-warming times provided snow reliably, and at the altitude of the Scheidegg slogans such as “Good snow for skiing well into May” and “First to open, last to close” were perfectly apt. 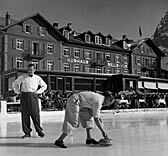 There was also curling in front of the hotel. In 1934 the Scheidegg guest team, supplemented by the hotel concierge, won the Jackson Cup, at that time more or less the world championship. Also in the 1930s local mountaineering took a highly dramatic turn. The Eiger, 3970 m, had been climbed for the first time already in 1858 by the Englishman Barrington, but the 1800 m high North Wall was only conquered 80 years later in 1938 and the North Wall variation known as the Lauper route, in 1932. All the famous climbers, from Barrington to Lauper and the conqeurors of the North Wall with Heckmaier, were guests on the Scheidegg, including the first to climb it in winter, the first on the direct route, the first to climb it alone, the first woman, the first Japanese and so on. Scheidegg was and is the base camp, the focus of international attention. Fritz and Emma von Almen survived the crises of the 1930s brilliantly and were thinking of building a ski-lift up the Lauberhorn close to the hotel in 1939 when the Second World War broke out. The skilift only started operating in 1941/42. They survived the war with the troops of the army's winter mountain courses. The bonds of friendship between the hotel owners and the soldiers brought many of the latter back as regular guests, with happy memories of the days when they were on ski-courses in field grey or white camouflage clothing. Meanwhile, Fritz von Almen had become a Major in the cavalry and a member of the National Council. He had also become an impatient man. He was itching to start building again. Now there were also two sons, Fritz and Kaspar, for whom occupations had to be found. The Bellevue and Des Alpes hotels were renovated in 1947 (the former having a bel-étage added), which ensured the continuing success of the Scheidegg. Within the family the son Fritz became owner and manager of the hotels on the Scheidegg, and after his untimely death in 1974, his wife took over. In 1998 she sold the hotels plus the surrounding land to her eldest nephew, Andreas von Almen - an architect by profession - who, together with his wife Silvia, a flutist, continues to run the business with confidence and optimism. The revolving door swings you into the entrance hall. Amazed hesitation - where am I? Yes, you are back in the 1920s and there's the “timeless touch of a country house”. Around the corner there's a reminder of the fin de siècle, another generation back in time. Is the altitude and the low pressure at 2054 m playing tricks with you? A time lag? The confusion you experience as you go back and forth in the years can be explained by the genuineness of the interior decoration, the furniture and the paintings. In front of the swing door to the 1929 bar hang photographs of the heroic figures who climbed the North Wall of the Eiger between 1937 and 1992. Sit on your bar stool and stay “on the rocks” and gradually location and time will fall into place. For access to our online image archive, press reports or all kinds of publications, kindly contact us by phone or e-mail. Despite careful examination we cannot be made liable for the correctness of publications. Operators of the Scheidegg Hotel are not liable for damages directly or indirectly caused by the use or non-use of the information provided on this website or through the use of incorrect and incomplete information, unless intentional or grossly negligent fault can be proven. The operators of the hotel are not responsible for the content of linked pages and in no way adopt their contents. Please contact us directly should you wish to make use of any of the contents on our websites. Thank you.